Helps reduce pain caused by tennis elbow. Measures 2" W x 32.5" L (5.1 x 82.6 cm) with a neoprene cuff with sewn-in pressure pad. Hook tab on cuff facilitates one-hand application. 15" (38.1 attached compression strap with look lock closure. Measurements based upon circumference of the forearm. 8-1/2" x 14-1/2" (21.6 x 36.8 cm). 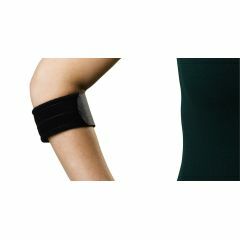 AllegroMedical.com presents The Tennis Elbow Compression Support Straps. Helps reduce pain caused by tennis elbow. Measures 2" W x 32.5" L (5.1 x 82.6 cm) with a neoprene cuff with sewn-in pressure pad. Hook tab on cuff facilitates one-hand application. 15" (38.1 attached compression strap with look lock closure. Measurements based upon circumference of the forearm. 8-1/2" x 14-1/2" (21.6 x 36.8 cm).